Want to experience the camaraderie and energy of the Oklahoma City Memorial Marathon with family and friends? Enter a team in the 5-person relay. 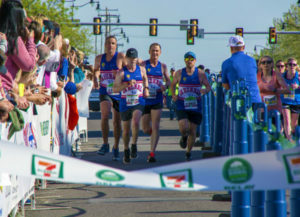 With two 3.1 mile legs, two 6.2 mile legs and one 7.5 mile leg the Relay has opportunities for runners of all skill levels and walkers are welcome. The first person to register the team will become the Team Captain. Click “Marathon Relay” and start to complete the registration process. Then select “Create New.” This is where you have the opportunity to come up with your team name. Be sure to tell your teammates the name that you created so that when they go to join your team they can find the correct team to join. Get creative! (Note: the Relay entry can only be paid once during registration). After you have created your Relay Team, you must have each team member register and join your team. On the last slide of registration, you can add other team members at the Checkout Summary screen. Click the ADD NEW ENTRY button, select the Relay option, and add your team members using SAME TEAM NAME to avoid additional fees. In order for prospective Teammates to join, they will need to go through the registration process themselves. Have each team member enter their personal information, then continue on to “Team Selection” and click “Join Team.” As long as the team member types in the correct team name, they will be added to your team, and their registration fee will be waived. Complete the rest of your registration process and you are successfully added to the team! If you need any help removing individuals from your team, changing the Captain of the Relay, or any other relevant inquiries, please contact us. There is one packet for each team. It includes all 5 bibs and the timing tag. Only one person from each team needs pick up the packet, but all are welcome in the Expo! Packet pickup confirmation is emailed to the team captain. A team consists of 5 members. Your team can be fewer than 5 members (one or more members running more than one leg), but entry fee is the still the same. A team member can participate in more than one event as long as he/she is registered in each event. You must register and pay any additional race entries if you choose to run more than one event. (Note: you may only run Leg 1 of the Relay if you wish to also run the Half Marathon. All other legs of the Relay take you into the Full Marathon course.) It is not possible to run the 5K course and participate in the Relay. Each participant will cross an exchange at the end of their leg. Relay medals will only be available at the Finish Line. Relay transportation is provided. Buses transport to and from the Relay Exchanges. Approximate ride times to the exchanges vary from 15 to 20 minutes, depending on distance. Leg 1: Runner 1 takes off from the Start Line, runs 10K and hands off to Runner 2 at Exchange Zone 1 – NE 21st & Lincoln in front of the Capitol. Leg 2: Runner 2 runs 10K and hands off to Runner 3 at Exchange Zone 2 – Wilshire & Classen. Leg 3: Runner 3 runs 12K and hands off to Runner 4 at Exchange Zone 3 – Huntington & Grand in Nichols Hills. Leg 4: Runner 4 runs 5K and hands off to Runner 5 at Exchange Zone – 7-Eleven at 31st & Classen. Leg 5: Runner 5 runs 5K to the Finish Line. Click here for a map and list of relay exchanges.